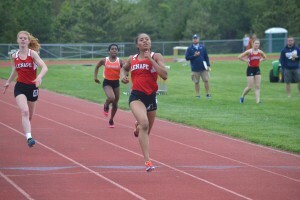 If you were to shadow Lenape High School junior track and field athlete Jasmine Staten at the May 11 Lenape Regional High School District Cup, you may get tired just following her around. Staten started out the day competing in 100-meter hurdles. She then competed less than an hour later in the 400-meter dash. Next, she left the Seneca High School stadium and headed to the jumping runway behind the bleachers to compete in the long jump. Finally, she returned to the track and competed in the 200-meter dash. Few athletes can compete in all of those events in one day. But Staten didn’t just compete in all of them; she won all of them. Staten was a quad winner at the LRHSD Cup, setting a season best mark in three of the four events. Even more impressive, she set meet records in both the 100-meter hurdles and long jump. Staten is used to running in multiple events. She’s participated in as many as four events going back to her freshman season in 2014. In the last three seasons, Staten has learned how to keep up her stamina throughout meets. Staten is motivated to make the spring season one to remember after her 2015–16 winter season ended in anticlimactic fashion. Staten was unable to compete in the season’s final events due to an illness. Missing a chance to make a return trip to the NJSIAA Meet of Champions after qualifying in the 2014–15 season was frustrating. The last two seasons, Staten has added new events to her arsenal. She began competing in the 100-meter hurdles during her sophomore season. This year, she has competed in the 400-meter hurdles during some meets. Some of the skills Staten uses in the long jump come into play during the hurdle events. This allows Staten to train for multiple events easily, as all of her events are short distance races (400 meters or shorter) or jumping events. Staten practices running and jumping on different days. During hard practices, she does multiple running stints with a tiny bit of time to rest in between. She credits this to building her stamina. Staten uses pre-meet prep sessions to practice jumping. Even though she looks fresh between events, Staten admits participating in four events per meet is not easy. Sometimes, she has to stop for a moment and re-focus in between events. Staten is hitting her stride as the season enters the final weeks. At the LRHSD Cup, Staten set season-best marks in the 200-meters, 100-meter hurdles and long jump. She wants to continue improving her results as she prepares for the NJSIAA South Jersey Group IV sectional meet on May 27 and 28.